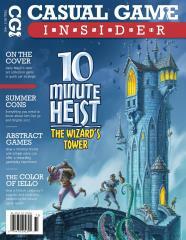 #21 "10 Minute Heist, Summer Coins, Abstract Games"
10 Minute Heist: The Wizard's Tower is a new set collection game by Daily Magic Games that is quick yet strategic. Plus: highlights from Gen Con 50 and Origins 2017, how abstract games can offer a rewarding gameplay experience, crowdfunding catastrophes (and how to avoid them), an interview with Kingdomino designer Bruno Cathala, and how IELLO's passion and creativity beautified the board game world. This issue also features reviews of Kingdomino, Amalgam, Herbaceous, Castles of Caladale, Aladdin and the Magic Lamp, Element, and Imagine.